Key Takeaways: S&P 500 strength not being confirmed overseas or among broad domestic indexes. Semiconductors remain a bright spot. Investor sentiment showing collapse in bearish opinions and after early-year outflows, pace of equity ETFs inflows accelerating. The march to new highs has stalled on the S&P 500 this week, and for now at least, the index remains within what has basically been a broad consolidation since January 2018. This followed a two-year long rally off of the early-2016 lows, which famously included a maximum peak-to-trough decline of less than 3.0% for all of 2017. The move toward the September peak in the S&P 500 has gotten more ragged of late, but it is not without bright spots. 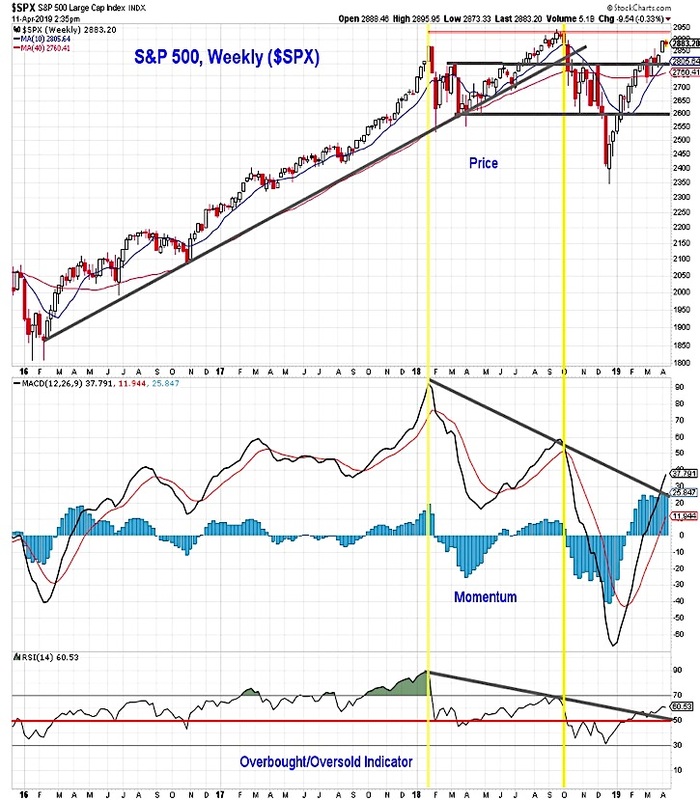 Both the weekly momentum and overbought/oversold indicators have broken above the down-trends that emerged over the course of 2018. While this improvement is encouraging, a new price high that is not accompanied by a surge in momentum at least above the September peak would be viewed skeptically. Additionally it will be important to see continued improvement in various measures of rally participation. In that regard, the expansion in the percentage of S&P 500 stocks trading above 200-day averages (from 55% to 70% over the past two weeks) is encouraging. Rally participation has been particularly sluggish when considered from a global context. While up sharply from early-year readings, still less than one-third of markets around the world have 200-day averages that are rising. 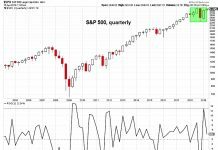 This indicator was deteriorating last year as the U.S. became an island of stock market resiliency prior to the fourth-quarter sell-off. A reading above 50% would suggest the longer-term trend dynamic has turned more favorable. Another way to consider the global context: while the China Shanghai Composite is up 33% from its lows, it is still 10% shy of its January 2018 peak. The S&P 500 has been a relative leader at home as well. Small-caps have begun to struggle on an absolute and relative basis, and the Value Line Geometric Index (which represents the price action of the median stock out of the Value Line universe of over 1500 stocks) has lost some steam as well. While rallying strongly in the wake of the late-2018 lows, it has stalled as it approached resistance, and the 2018 highs remain well in the distance (8% above the current level). 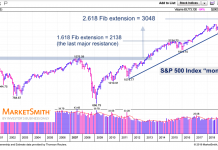 Strength in the S&P 500 has found support in the semiconductor index, which has already cleared its 2018 highs from a price perspective. On a relative basis (versus the S&P 500), semiconductors are testing resistance that emerged in late 2017 and the first half of 2018. 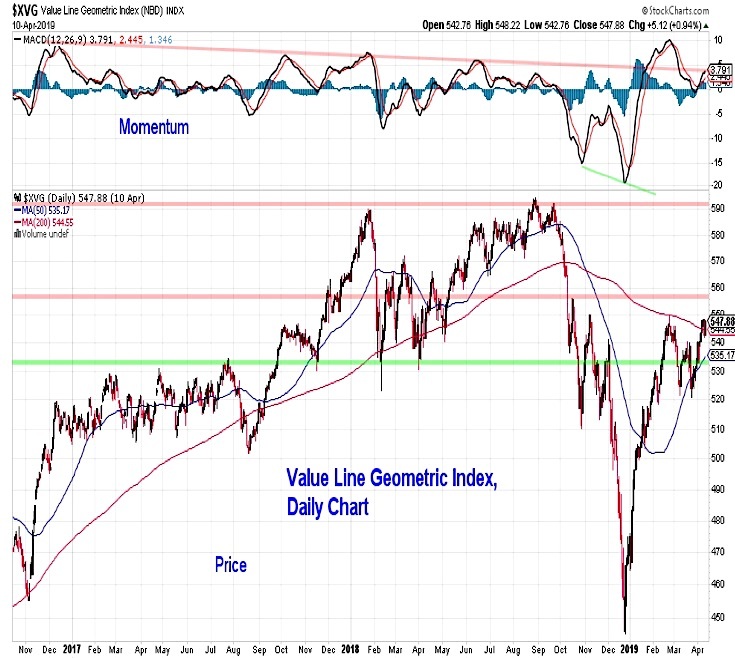 The new price highs have come as momentum has stalled. Surpassing the February momentum peak would assuage some concern that the price rally in Semis is setting up for a replay of 2018 (when price was unconfirmed by momentum and ultimately rolled over). In addition to look for confirmation of stock market strength, we are also keeping a close eye on sentiment. 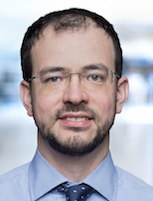 While investors initially viewed the 2019 rally with skepticism (January saw the most equity ETF outflows since 2010), more recent data has showed increased optimism. The NAAIM data shows that investment managers have increased equity exposure since the first quarter and bears on both the AAII and II surveys have dropped to near 20%. 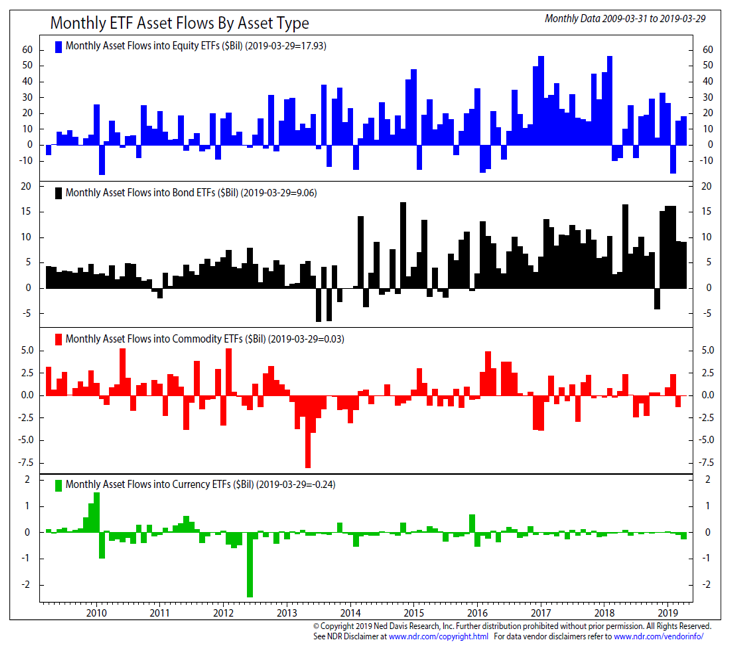 After seeing a total of $18 billion in inflows in March, Equity ETF’s have already attracted $15 billion in the first week and half in April. 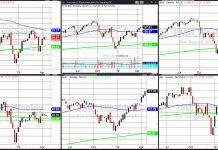 With breadth not breaking out to the upside, resurgent optimism could open the door for increased volatility heading the second quarter.